This thrilling obstacle course captures all the fun and excitement of a real amusement park! 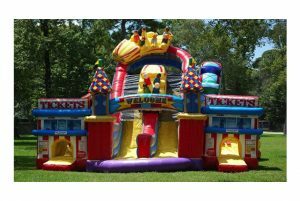 With the eye-catching digital graphics, tackle dummies, squeeze plays, climbing walls, and a slide, all kids are sure to enjoy! 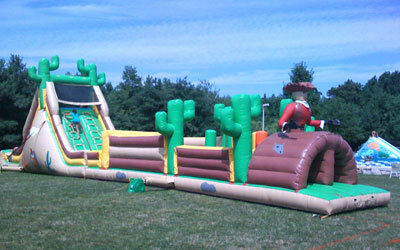 Get ready for combat on this THREE LANE course as you challenge your opponent to the ultimate Boot Camp Challenge! 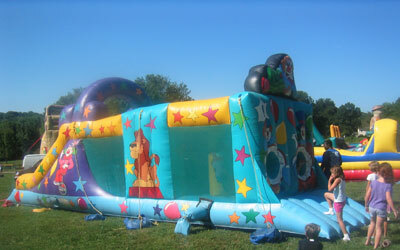 What tactics will you use when you jump through your first hole and squeeze through the inflated pillars? Climb the ladder to the top and slide to victory! 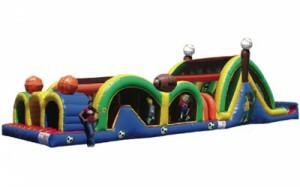 Let’s clown around in this attractive multi-fun obstacle course. 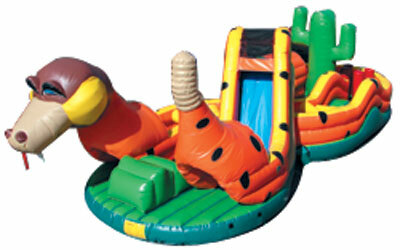 Make your way around the obstacles, squeeze thru logs, climb up the wall and slip down the circus slide. You better move fast through this explosive one-of-a kind obstacle course or you might get blown up! 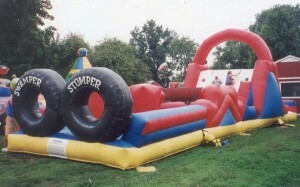 Two participants race through the safety cones, under the detonator, climb up the wall avoiding the sticks of dynamite and slip down the wrecking ball slide to safety. 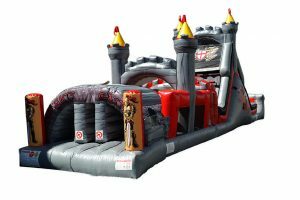 Description: Add this breathtaking medieval 3-lane obstacle course to your next event! This piece will take you back in time as you climb through and slide down this dragon-themed obstacle while racing your opponents! 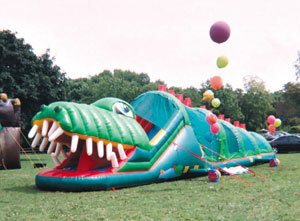 Climb into the tail of this friendly goofy gator obstacle course & race over, under and through all the obstacles to the end where you climb up and slide out of his mouth. 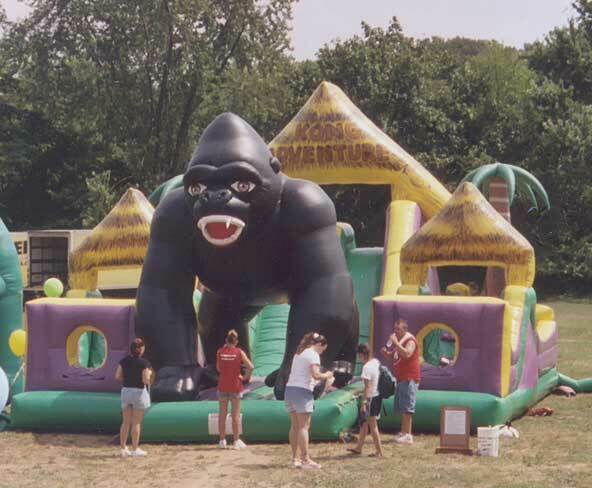 Two participants make their way through the obstacles of the jungle, climb up the wall and slip down the slide finishing between Kong’s legs. Explore the Pharaoh’s Tomb obstacle course for lost treasure! 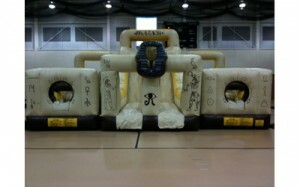 Race through the obstacles and then quickly down the slide in this ancient Egyptian themed obstacle course. See who can navigate through first in this two person course. Arrrgh Matey! 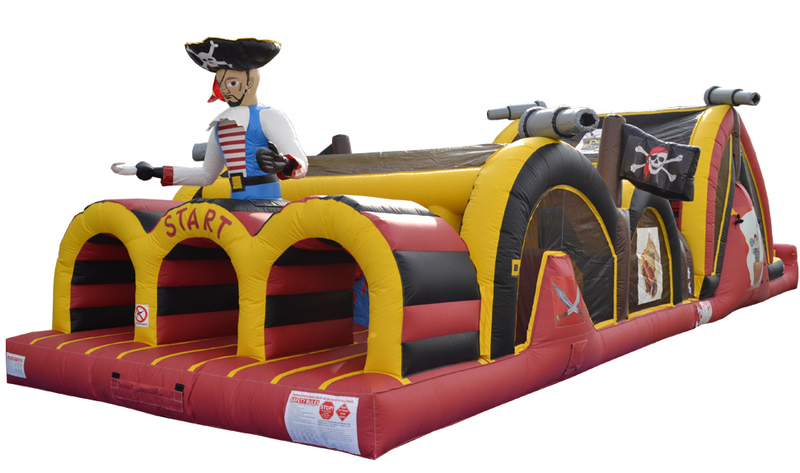 Race two of your friends through our beautiful pirate themed triple lane obstacle course. But you’ve been warned! The last to the end will be made to walk the plank! 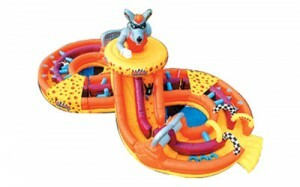 Two participants race in opposite directions in this figure eight obstacle course to see who can make it to the finish line first and become the Big Cheese! 3-2-1! 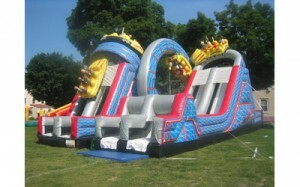 Take off thru this space themed obstacle course & slide down space mountain to end the race. Rev up your engines! 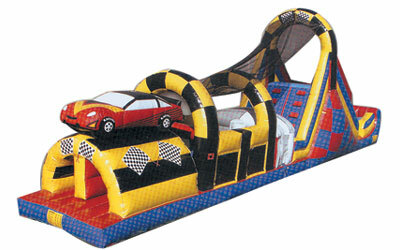 Race as fast as you can to finish first past the checkered flag on our new race car obstacle course. WOW!!! Check out our THREE LANE obstacle course! The first of its kind. 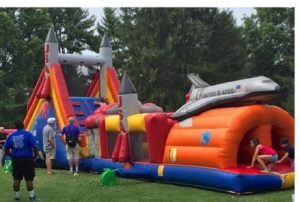 This colorful sports themed obstacle course will move your crowd even quicker then the classic 2 lane courses and has the added benefit of being completely covered my mesh netting keeping the participants shaded from the sun. 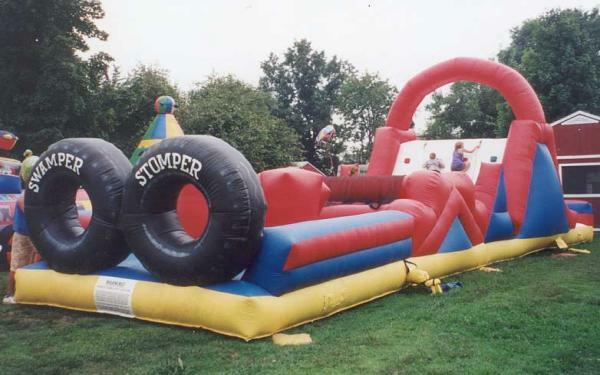 Two persons race through this combination of monster truck tires, pylons, log rolls, ramps, log jam, climbing wall and slide. Will you be the ultimate survivor? Race pass the Tiki’s, thru the tunnels, over the rock walls, squeeze thru the inflatable barriers and slip down the giant slide on this amazing adventure obstacle course. Howdy Partner! Race through a massive 72 FEET of obstacles on our extended attractive obstacle course which also includes a wall climb and a slide. Do you need a “WOW-Factor” for your next event? This obstacle course mirrors the excitement of a real roller coaster. 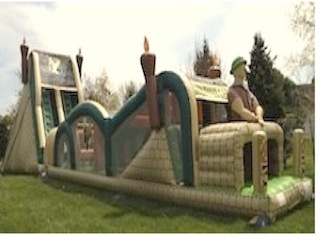 Two participants at a time race up the mountain to the top, slip down the slide, travel through the obstacles in the back, climb up and slip down another slide & finish after the squeeze-thru.